Milind Soman is an Indian supermodel, actor and a film producer. 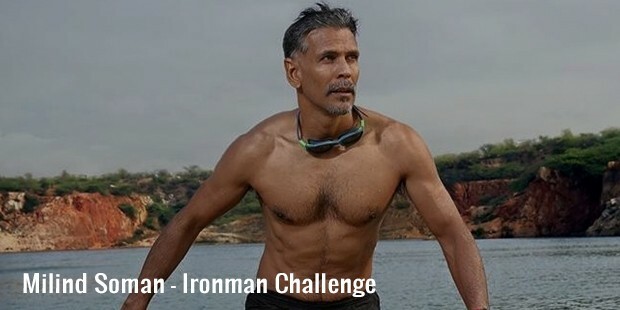 He is the first Indian to successfully complete the Ironman Triathlon. He holds Limca Record for running 1,500 km in 30 days and is the ambassador of Pinkathon, India’s biggest ‘women only’ marathon. Milind Soman featured in Alisha Chinai’s “Made In India” music album and worked in movies like 16 December, Bheja Fry. Milind Soman also appeared in Fear Factor: Khatron Ke Khiladi (Season 3). Milind belongs to a Maharashtrian Brahmin family. He was born in Scotland to Prabhakar Soman and Usha Soman on 4 November 1965. His family moved back to India when he was only seven years old. He was a national level swimmer prior to entering the field of modeling. Milind was rejected in early days of modeling. HE met Ratna Behl who later called him up for a modeling assignment. He started his modeling career with Thakersay Fabrics in 1989 and earned a whopping amount of Rs. 50000. His thin and dark look made him stand out of the league of stereotype models and designers promoted him. He was soon labeled the first supermodel of India. An international agency signed him for shows in London and Paris. 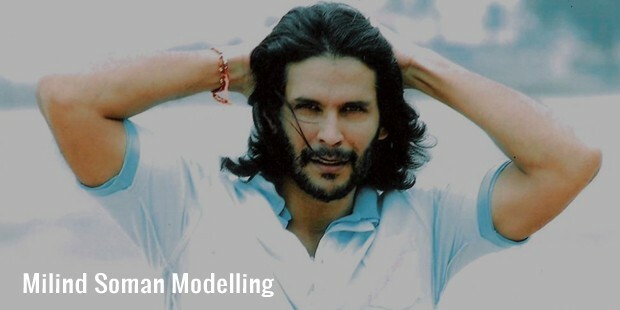 Milind featured in Alisha Chinai’s video “Made In India” and then pursued his modeling career. He later signed movies which did not do much to his career. His debuted on television as Captain Vyom and later moved on to sign films. He movies include 16 December, Pachaikili Muthucharam, Paiyaa, Agni Varsha to name a few. Milind acted in a Marathi film Gandha by Sachin Kundalkar. Milind also produced a Hindi film Rules: Pyaar ka Supehit Formula. He has many English movies also in his bag including Valley of Flowers and The Flag. He acted in a Swedish film also by the name Arn-The Knight Templar where he portrayed the role of Saladin. His movie, Jodi Breakers released in 2012 which did not do well at the box office. 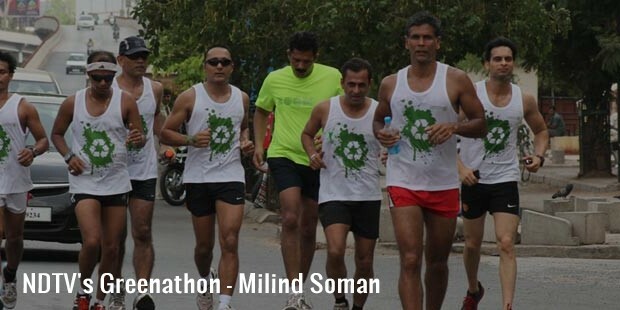 Milind is known for his athletic body and is often referred to as the Ironman after winning the title in Zurich. He became a Limca Record holder for running 1500 km in 30 days for Greenathon. He also set up women’s’ only running event “Pinkathlon” under his guidance to create breast cancer awareness. He started an event management company during his swimming days and handled events which featured Jagjit Singh, Amjad Ali Khan and Bismillah Khan. He has also worked in the first English soap in India, A Mouthful of Sky. Milind was the national swimmer prior to his modeling career and held the National Swimming Championship title for four years. 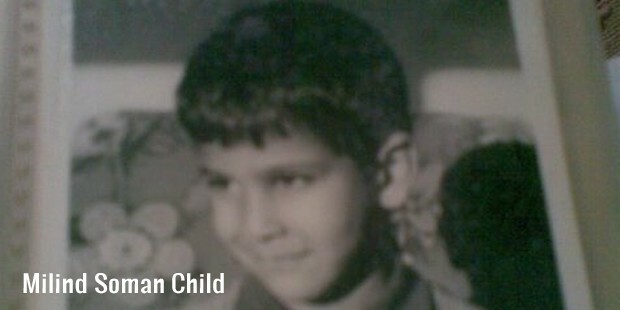 Milind first crush was when he was six years old. She was a Swedish girl but his love ended even before it started as his family moved back to India. He later fell in love at the age of twelve and dreamt about her for five years. The relationship ended after three years when things never matured to further stages. He then dated Madhu Sapre, a model with whom he worked in numerous fashion shows in London and Paris. Milind married his French Co-star, Mylene Jampanoi of the film Valley of Flowers. They got married in Goa. They divorced in 2009. Milind completed the Ironman Challenge held in Zurich in 15 hrs and 19 mins. The Triathlon included 3.8 km swim, 180.2 km cycle ride and 42.2 km run which the participants needed to complete in 16 hours to win the Ironman title. Milind has also held the Indian National Swimming Championship for four years. He worked in critically acclaimed movie 16 December which was a commercial success.